Kazuki Kitamura as Kyutaro Madarame. The Japan Foundation Los Angeles, 5700 Wilshire Blvd., Suite 100, Los Angeles, will screen “Samurai Cat” (100 minutes, 2014), directed by Yoshitaka Yamaguchi, on Wednesday, Jan. 13, at 7 p.m. 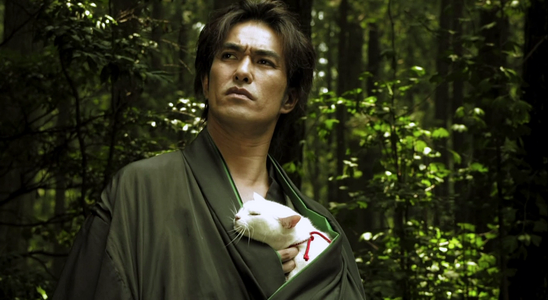 Starring acclaimed actor Kazuki Kitamura as Kyutaro Madarame, a masterless samurai, the madcap “Neko Samurai” wonders aloud: “What if we mashed up two of Japan’s most beloved cultural icons, the samurai and the cat?” The result: one of the most delightfully cute comedies to come from Japan in some time. JFLA provides high-quality Japanese film screenings every second and fourth Wednesday. Free to attend. Reservation is not required.